The dama gazelle is found in Saharan Africa. It has long legs, a long neck, and short, curved horns. The average head and body length of adults is 40 to 67 inches and they can weigh up to 185 lb. Shoulder height averages from 35 to 42 inches, and its horns average from 35 to 42 inches. The coat of the dama gazelle is reddish brown, and its underparts, rump, and head are white. There is also a white spot on its neck. The dama gazelle prefers a solitary life or living in small groups. During the wet season, it moves to the Sahara desert, and in the dry season it moves out of the Sahara to moister habitats. Diet consists of shrubs, acacias, and desert dates. This species is drought resistant, and can live off the water droplets found in its plant food. The female gives birth to only one after a gestation period of 160 to 220 days. Dama gazelle numbers have fallen by about 80% in the last decade and continues to fall. 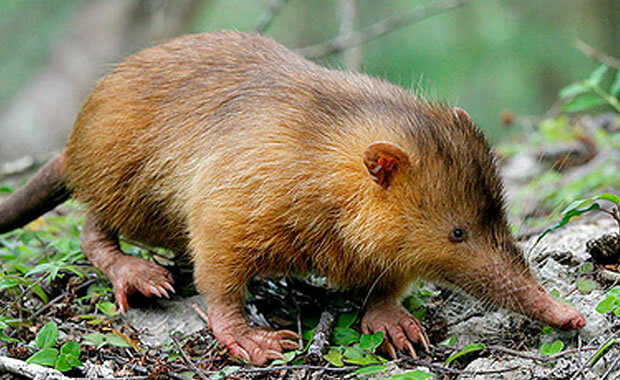 The main threats to the species are illegal hunting, habitat destruction, and drought. Also, other grazing animals compete with the dama gazelle for food. Droughts have forced many numbers of the species to move south and out of their habitat range in search for food. This results in greater contact with humans and an increase in poaching activity. To help conserve the species some are kept in captivity in collections but representation of certain races is very problematic. Some animals have been released into fenced reserves in Tunisia, Morocco, and Senegal. Copyright Notice: This article is licensed under the GNU Free Documentation License. It uses material from the Wikipedia article "Dama gazelle". Glenn, C. R. 2006. 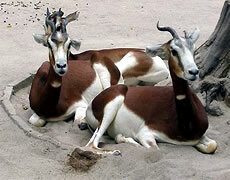 "Earth's Endangered Creatures - Dama Gazelle Facts" (Online). Accessed 4/19/2019 at http://earthsendangered.com/profile.asp?sp=162&ID=1. Need more Dama Gazelle facts?